Cover: Handmade paper made from Saskatchewan long grass. 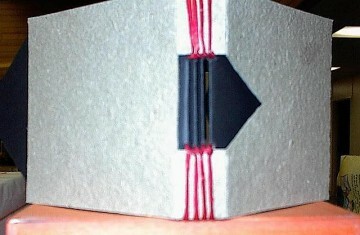 Paper: Red is Classic Linen #80 cover; black is Via #65 cover. Thread: Coloured and waxed linen. Ink: Dr. Ph Martin's Bleed Proof White. Dimensions: approximately 4" x 5" (10cm x 13cm), as each one was hand cut individually and tweaked to fit the limited amount of cover paper I had. Edmonton, Alberta Canada. See her artist book in Pauline Sager's 1st Book Swap.